We’ve always been fans of Teese, a vegan cheese substitute that took the art of cheesy taste and texture and put it firmly on the vegan map. We started going to pizzerias again, ate paninis for the first time in years and just generally enjoyed ourselves in ways that were hitherto taboo! 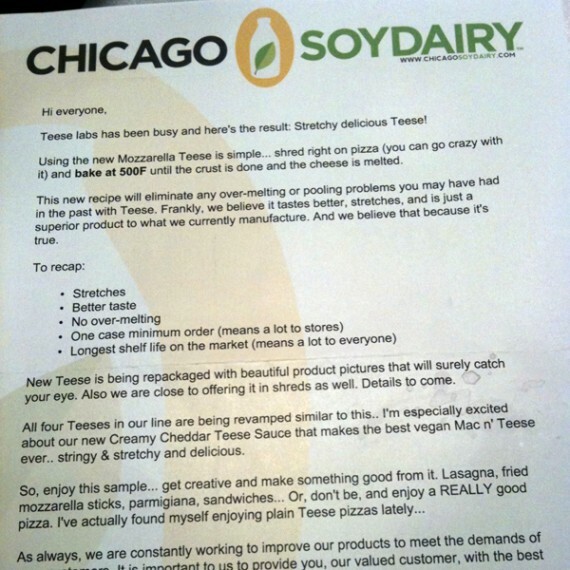 We were delighted, then, when Chicago Soy Dairy sent us a preview of the latest creation they’ve been working on: Tasty, stretchy, vegan MOZZARELLA cheese, that comes as close as you can get to the “real thing”. We set about challenging the new formula, and were, frankly, blown away with the results. Most vegan cheeses today aim to emulate the taste and texture of regular, velveeta-style or pizzeria-like cheese but we found something different in the latest offering from Teese—something more flavorful that lends itself to a variety of dishes. – Tasty: Like Teese of old, but better. Even when eaten straight out of the package, its flavor is excellent. 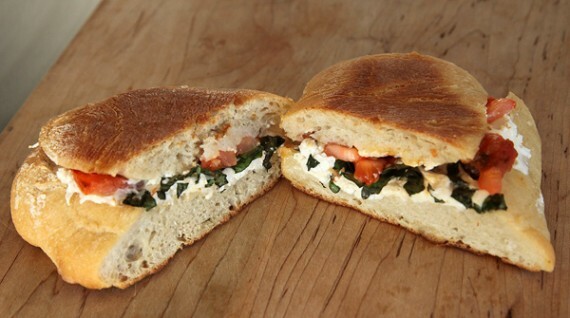 – Awesome in a panini. – Pizza works really well. 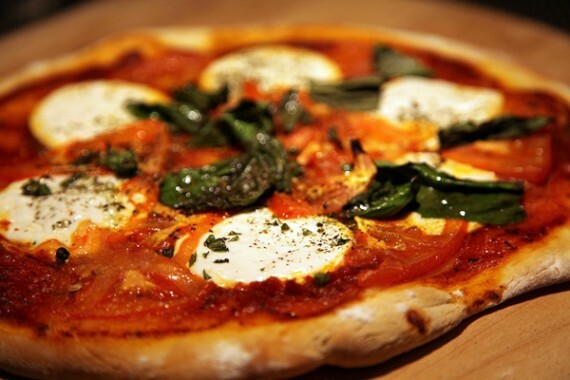 It’s excellent on both a normal pizza (pictured above), as well as an NY style “buffalo mozzarella” pizza. The buffalo mozzarella pizza was a complete WIN, and the closest I’ve had to vegan NY-style pie yet. This only goes to show how versatile and impressive the new Teese is, even in these early stages. Get excited, get very excited. When this product hits the shelves, you are going to LOVE it. Of course we will keep you posted, and let you know when this Teese is available to the public. Lookout! Wow- now I’m excited! That looks amazing!! This does look amazing. When will it be available? That NY style pizza with the mozzarella circles takes me right to Greenwich Villiage. 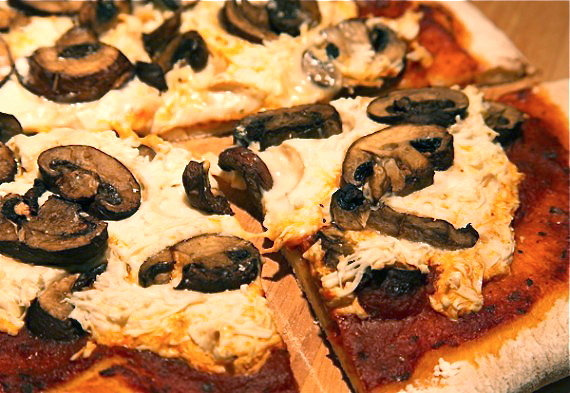 I am so glad there are going to be more vegan cheese offerings. Need to switch out the Daiya every once in a while. Is this better than Daiya? Hope this is better than their previous formula. I have some leftover mozzarella Teese in my fridge and every time I shred it, it’s moist and sticky. 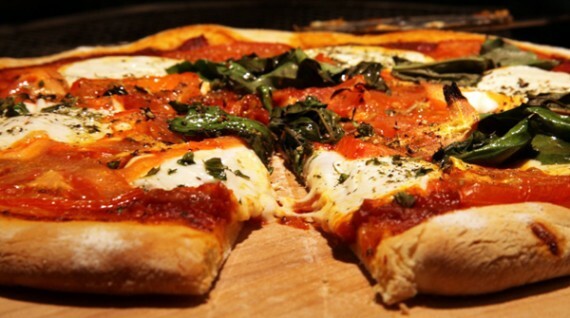 When I make it with pizza, it’s bland and takes a long time to melt. I’ll try this when it hits the shelves, but till then I’m sticking w/ Daiya. 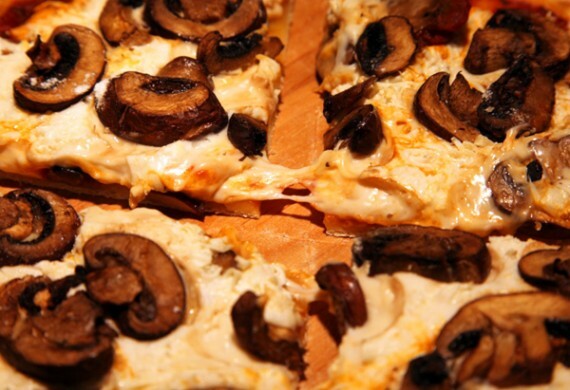 It sounds like we’re in need of a stretchy Teese pizza and panini tasting party ASAP! Everything looks soooo goood! I love this page! @Brett – you are right. Old Teese was enough to get us by for a while, but it got stamped out overnight by Daiya, a far superior product on every level. Seems like the Chicago boys are fighting back with this, and judging by the pictures above, we’re in for a treat. QG: WHEN WILL THIS BE AVAILABLE? definitely looking forward to trying this stuff. looks awesome. Oh cool. This is very exciting. Oooh this is exciting! I like that Teese comes unshredded. I really want to make a vegan caprici salad. Do you think the uncooked taste is good enough for that? Man, that looks goooooood! Can’t wait until us common folk can get our hands on some! I hope their mozzarella tastes better than Daiya. Glad the sample went over well! We’re really excited about the changes we’ve made. We are in the midst of finalizing a packaging redesign and our “beta” taste test with some of our blogger family and close friends. We have a few more minor tweaks to make. Unofficially we should have the new recipe out the door and on store shelves very very soon. You won’t have to wait too long! If you see the new packaging then you know it’s the new recipe. We have made changes to all four of the Teese flavors (Cheddar, Creamy Cheddar, Creamy Nacho and the previously discussed Mozzarella). We think you’re going to like the Creamy Cheddar a whole ton. So amazingly close to Velveeta. 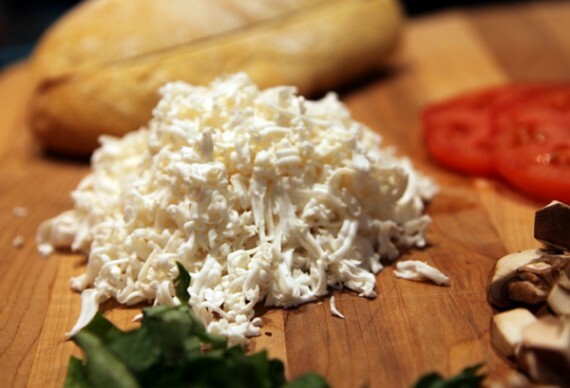 Shells & Cheese (or Shells & Teese as we like to say) will blow your mind. The consistency is awesome and it’s stringy and stretchy. We’re really proud of what we’ve done! @Brett and anyone else who’s had it in the past but preferred another brand, we hope that you give it another try when you encounter this in the wild. I encourage you to supply me with any feedback directly (danreed@welovesoy.com). We’re always happy to hear from our customers and your thoughts! I am so excited about this! I love Teese and I can’t wait to try the new and improved version! What sort of store does one even buy Teese at? I’ve never seen it at any store: no Whole Foods, Trader Joe’s Erewon, or grocery chains. Please don’t make me mail order. We’ve had a few comments and emails asking if Teese is better then Daiya. We deliberately didn’t compare them head-on, as Chicago Soydairy were clear that their product was not the final one, and they were still making some changes. When we do get final product we’ll for sure do a shoot-out, and I’m very much looking forward to finding out who the winner will be. At this stage, while we can’t confidently state which (if any) is better, I can guarantee that Teese will certainly give Daiya a run for its money, and provide a choice in the stretchy, tasty vegan cheese space! Thanks for posting this!! Sooo exciting! Did they send you a list of ingredients? Wonder what it’s made out of. Did they say if it’s gluten free? My question is how the texture is! Does it have that creamy, coat the roof of your mouth consistency like Daiya, or was it different? Daiya gives my digestive system big problems. I am looking forward to trying this! The original Teese mozzarella worked well on pizza and sammies for me, and I liked the flavor, although I thought it was a bit ‘lemony’ (I know they’re trying to tone down the soy taste). Was not a fan of the cheddar style, though. I’m not as concerned with ‘stretch’ as I am with flavor, but will absolutely try the new version as soon as it is available. One other thing, Teese has an AMAZING shelf life in my fridge, it’s almost freaky. I have found Teese for sale at Follow Your Heart. For the people wondering where it can be purchased at. I am sure Follow Your Heart will have the new product when it’s available. Ugh, FYH, that’s like a road trip and a half. I ordered the original white Teese once and the taste was ok but these were my problems with it. The color is unnaturally white like a piece of chalk (from the titanium dioxide coloring). After melting it turned into a soupy liquid. It has a slightly chemical aftertaste. I am looking forward to trying the new style Teese though.